[SatNews] Want to build a Satellite, but don't have a NASA sized budget? While a Cubesat may cost the same as a house, a PocketQube could cost less than a car. PocketQube’s are a new class of satellite which are a low-cost entry point for small budget organizations such as Universities, Amateurs, Space Agencies and High Schools. The first four PocketQubes were launched into orbit last year, with many more in development around the world. 1p PocketQube Render in Orbit...Want to build a Satellite, but don't have a NASA sized budget? 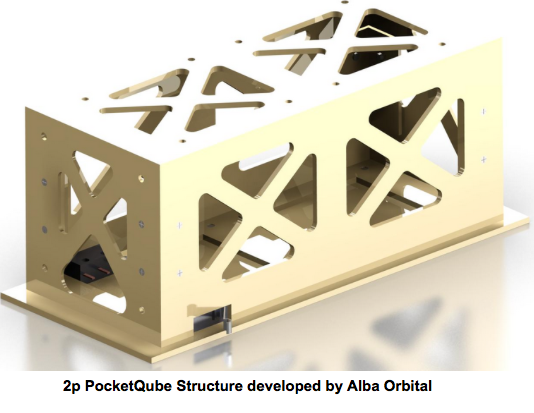 PocketQubes are dramatically lowering the costs of satellites. While a Cubesat may cost the same as a house, a PocketQube could cost less than a car. Tom Walkinshaw Founder/CEO of Alba Orbital Ltd (PocketQube Shop) said, "We are very honored to receive this SMART award which allows us to develop a cutting edge PocketQube EPS. It is great to see Scottish Enterprise’s belief in what we are trying to accomplish by widening access to space and we are very grateful to have their support." The 5x5x5cm, 0.15kg PocketQube standard has evolved to become the basis for one of the most widely accepted families of picosatellite designs and was originally proposed by Professor Bob Twiggs at Morehead University. Alba Orbital Ltd (PocketQube Shop) based in Glasgow, Scotland, wants to get more people building and launching their own satellites. They provide a hub for the fledgling class of PocketQube satellites by offering a one-stop-shop with the largest selection of parts available anywhere. Having successfully closed a Kickstarter campaign they are now growing their product range.